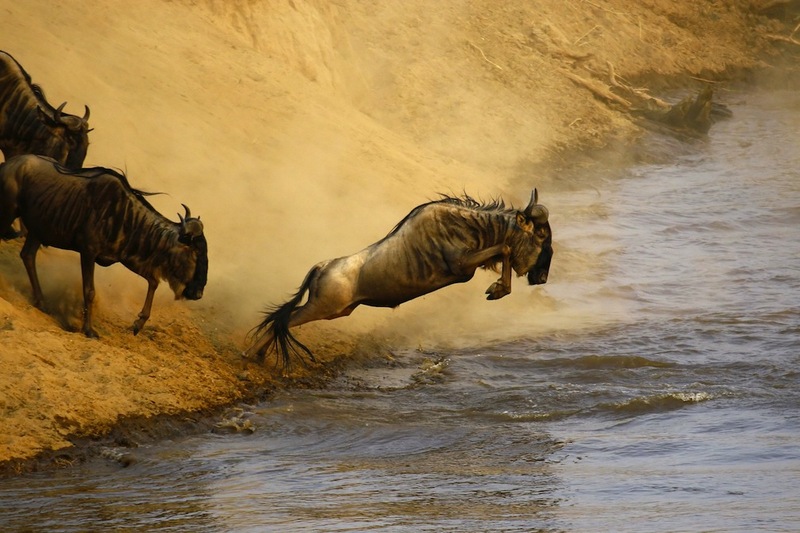 Every year in East Africa more than a million wildebeest –– along with hundreds of thousands of zebras –– complete a thousand-mile trek between the grassy plains of the Serengeti in Tanzania and the Masai Mara in Kenya and then back again. Why? Wildebeest eat grass, and lots of it. They’re following the new grass growth generated by the annual rains, and where there’s new grass the wildebeest go. The journey is not only long, it’s also filled with danger. The vast herds are a walking larder for lions (and other predators) and every time the wildebeest cross the river that intersects the Serengeti and Masai Mara, they are met with hundreds of crocodiles, all eager for an easy meal. Wildebeest, also called gnu, are part of the antelope family. They’re funny looking creatures with long faces and furry beards that communicate by grunting at each other. They’re also surprisingly fast and can run at speeds up to 50 miles per hour. However, that’s no match for lions or lurking crocodiles, and for survival it’s all about safety in numbers –– hence the group trek better known as The Great Migration, one of the most spectacular wildlife events ever. By January, the vast herds are back in the Serengeti where they give birth to thousands upon thousands of new calves. Then they wait for new rains, which brings new grass and the cycle starts again.